Learning is an important characteristic of leadership. Leaders should be fast learners. Leaders need to understand learning ability of followers and change the style of education to make them understand the vision or purpose. Different people have different ways to learn things. There is no right or wrong way in learning styles. Some people see things and understand. Some people do experiments to learn. Some people may just think and correlate. Leaders spend most of the time in understanding follower’s development levels, and change their teaching methods to educate them based on that. Learning improves the working ability which in turn gives out the expected outcome, which is otherwise called as improved performance. Even those who fail to understand by one approach of learning, can understand things well if we change the learning style. Number of theories evolved in learning styles like Kolb Experiential Learning theory, Honey & Mumford Learning Styles, Allinson & Hayes. These learning style models designed on Learning styles are both flexible and stable. Out of these let me brief Kolb’s experiential learning. Kolb produced the first systematic and comprehensive exposition of the theory of experiential learning. His experiential learning theory has wide acceptance by academics, teachers, managers and trainers as truly seminal works. It explains fundamental concepts towards our understanding and explaining human learning behavior, and towards helping others to learn. 1. Learning is best conceived as a process, not in terms of outcomes. 2. Learning is a continuous process grounded in experience. 3. Learning requires the resolution of conflicts between dialectically (debating) opposed modes of adaptation to the world. 4. Learning is a holistic process of adaptation to the world. 5. Learning involves transactions between the person and the environment. 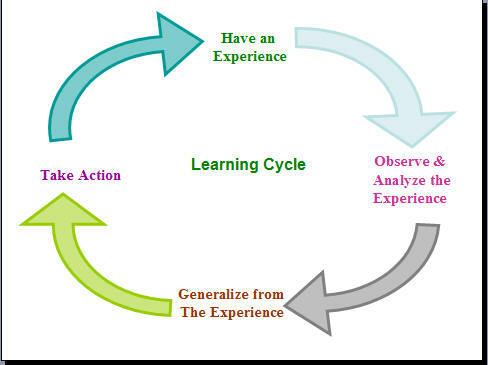 Kolb describes the process of experiential learning as a four-stage cycle. * is controlled in the expression of emotion and prefers dealing with technical problems rather than interpersonal issues. * adapts by observation rather than by action; interested in people and tends to be feeling-oriented. * thinks it more important that ideas be logically sound than practical. * at ease with people but sometimes seen as impatient and ‘pushy’. Learning styles play a significant role in different fields – mainly in educational, professional career and adaptive competencies. 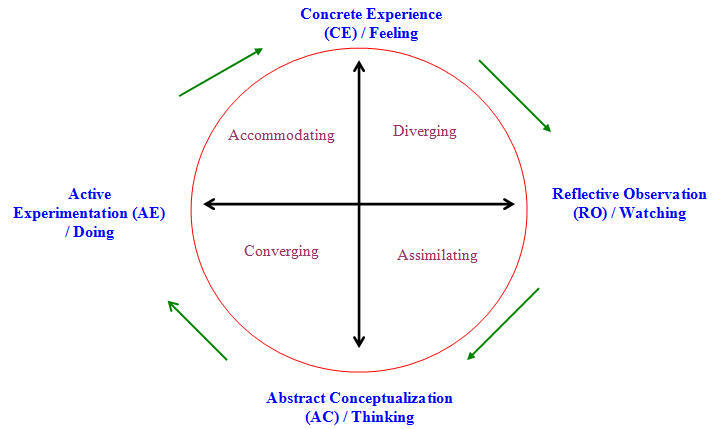 The most relevant field to explore experiential learning theory is that of educational specialization. ‘Learning styles represent preferences for one mode of adaptation over the others; but these preferences do not operate to the exclusion of other adaptive modes and will vary from time to time and situation to situation’. To summarize the benefit, successful projects need to employ a range of learning styles to capitalize on the strengths and minimize the weaknesses of each style & it helps leaders to setup good coaching relationship. 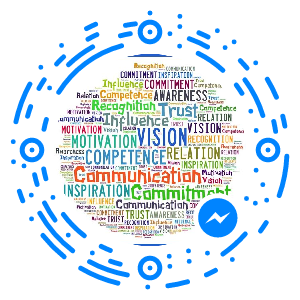 This entry was posted in Communications Management, Leadership and tagged Communications Management, experiential learning theory, Kolb, Leadership, Learning Styles. Bookmark the permalink.